In honor of Children's Book Week (yay! 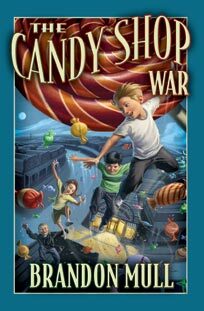 ), plus the fact that The Candy Shop War is currently in our Book Giveaway, I wanted to let you all know how sweet and magical this book is! First I just love love Brandon Mull. His stories are sophisticated, filled with imagination and suspense. His plots seem to have many twists and turns and yet it somehow gets resolved logically and in unexpected ways. I have to admit, I was a little hesitant to read something besides his first series, Fablehaven. I thought it would be just another variation of that story. While Candy Shop does have similar themes, it was a completely different story with different magical elements. Not only does Mull's stories captivate, he has superb writing skills and witty conversation. Note to parents: While there are some mild elements that may need a parent's caution (i.e., a scene with a weapon or combat), the scenes are not graphic. Book 2: Arcade Catastrophe is expected to be published October 2012.